You know all your favorite bartenders at those hotspot bars you like to frequent? Turns out a majority of them did not attend bartending school. Most likely they were either taken under someone’s wing or trained on the job. And yet that’s not surprising, as bartending schools have gotten a bad rap over the years, and with good reason. They’re often overpriced ($200-$800 per course), use outdated information, AND you don’t even get to taste the alcohol. “Everything that you learn at those current schools, it’s in one ear and out the other as soon as you get a job, provided that you do get one,” said Joseph Brooke, co-founder of the new Mixology Master Method bartending school. As someone who has vetted plenty of resumes while he ran the bar programs at The Edison and Mixology 101, he says that listing a bartending course on your resume does nothing to speak for your experience, knowledge, or skill. So he and bartender Martin Cole decided to create and teach the “first mixology course in Los Angeles.” One that will not only teach how to make drinks but the proper way to shake, which cocktails you absolutely need to have in your back pocket, basic hospitality, how to set up your station, even distillation and fermentation; definitely more than the average Googled bartending school. Their goal is to offer a legit learning experience, one with a certificate of completion that will be highly regarded by potential employers instead of pooh-poohed. But before they could pull together their curriculum for the course, Brooke and Cole each enrolled in two popular L.A. bartending schools, the two that appear at the top of the search for “LA bartending schools,” in fact. There they basically learned what they didn’t want to do. 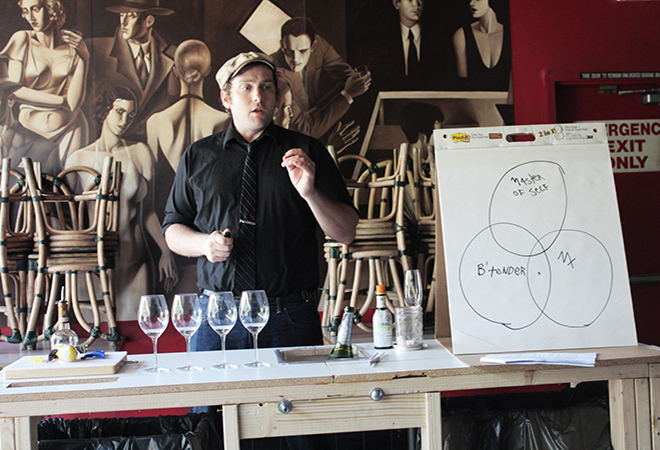 Here’s what they found bartending schools, ones that are available nationwide and have been offering courses for years, are doing all wrong and how their Mixology Master Method class seek to changes that. Hiring inexperienced instructors who are teaching from an outdated manual. Brooke has experience running his own bar programs while Cole runs a special events company featuring bartenders. “[Bartending school instructors are] not people like Joe and myself who not only have been doing it for a long time, but have been doing it the way it should be for a long time,” said Cole. Teaching you how to make 500 cocktails that customers don’t order anymore, like the Sloe Comfortable Screw. Making it easy to pass the course by giving you the questions to the test the week before. Since you’re not allowed to taste the alcohol, they have you practice making drinks with colored water. “Have you ever heard of a culinary school that doesn’t let you taste the product? Why does that not apply to modern-day bartending school?” said Brooke. At MMM, you’ll be able to taste spirits to help develop your palate and discern what good spirits tastes like. Offering crappy jobs upon class completion. Both Cole and Brooke, who are steeped in the L.A. cocktail community with ties to USBG in Southern California, can totally hook you up. And Cole runs his own private events company called British Bartenders where he’s always on the lookout for new recruits.